WheelScan 5 Installation | Rotable Repairs Ltd. In a drive to increase efficiencies Rotable Repairs and pleased to announce its most recent addition to its NDT department, the WheelScan5. This automated system uses eddy current to detect flaws or damage in aircraft wheels of all sizes. WheelScan enables operators to perform inspections faster without compromising inspection integrity. Aircraft wheels are subject to high level cyclic fatigue, particularly during landing. To ensure the safety of passengers and the aircraft, it is important that the wheels are maintained to the highest standard. Eddy Current wheel inspection is widely accepted throughout the world as a rapid and reliable means of maintaining the integrity of aircraft wheels. The unit covers the wheel with inspection speeds up to 2 ms-1 (78 inches/second). 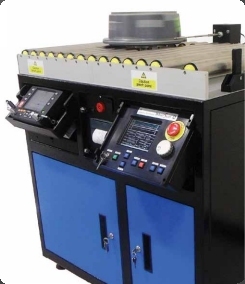 All inspections are specified with a constant surface speed rather than fixed RPM, allowing the eddy current filters to give the best possible performance, irrespective of the amount of wheel taper. The operator can set up a wide range of helix settings to arrive at the quickest inspection for the required surface coverage. In addition, the stepper motor drives take the probe rapidly to the start of the inspection at up to 150 mms-1 (6 inches/second) to minimize inspection cycle time.